The Office of Management and Budget and its federal awarding agency colleagues have been on a mission — to assure that federal grant recipients and subrecipients “establish and maintain effective internal control” over the property acquired with the funds made available to them. But now there’s an additional wrinkle: The Trump Administration has floated some new requirements about recovery and disposition of federally funded assets as part of its proposed infrastructure rebuilding program. The rules for use, management, reporting and disposal of that property are already complicated. And they vary depending on what kind of property is involved — equipment, supplies, real estate or intellectual property. But a couple of things are certain across the board. Compliance with the applicable requirements is readily auditable, and findings of noncompliance almost always demonstrate deficiencies of internal control. So, it’s little wonder that auditors spend so much time looking at what they know is fertile territory. With grant-acquired property so much in the crosshairs, it makes sense to gain a solid understanding of the applicable requirements now, particularly those that were changed or clarified in OMB’s recently issued “Super Circular.” This webinar will enable you to understand the requirements and discharge your responsibilities effectively to safeguard these federally funded assets. 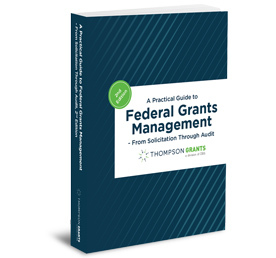 Join Bob Lloyd, principal of Federal Fund Management AdvisorÔ and a respected authority on federal grants management policies, for this fast-paced and thorough session.